With our 6243 Series Two-Flute Compression Style Router Bit you get the versatility of a solid carbide compression bit with the benefits that come with insert tooling! The 6243 Series Router Bit is a two-flute compression tool with replaceable insert tips designed to create a chip free surface finish on solid wood and laminated panel products. With two solid carbide insert tips shearing downward and 2 inserts shearing upward the 6243 series provides a chip free surface finish on laminated panel products as well as solid wood for jointing, trimming and sizing. The upper and lower inserts are interchangeable as are the bottom and peripheral cutting knives. When it comes to machining thicker materials and when a larger diameter is acceptable, this up/down shear (compression) insert router bit is an ideal alternative to a 3/4″ solid carbide compression bit for machining double sided laminated panels, solid woods and plastics requiring a high quality, chip free finish. Initially only available with single sided inserts, this series has been completely redesigned to utilize double sided inserts providing a longer run time and cleaner cuts. With the recent design change, the cost effectiveness of this tool has increased dramatically. Reduce your tooling inventory and tooling cost substantially while improving efficiencies with a tool that offers a constant cutting diameter, economical inserts, rigid tool body construction and excellent finish results! Interested in more information? Give us a call at 1-800-544-8436 or contact us now! We’ve had some interest around how the costs break down in our last post, “Increase Productivity with Insert Compression Router Tooling”. Here is an example using the same 6243 series (PN#6243.029.34 with insert#6243.295.00) two flute compression style insert router bit for comparison against a solid carbide two flute compression spiral (PN#6229.750.20M) to see how the costs stack up. As you can see from the following chart the breakeven payoff for using insert tooling comes at around 45K linear feet machined. The difference in tooling cost becomes more noticeable at around 100K linear feet machined where the cost of tooling is reduced by >50%! If large diameter router bits (3/4″ +) is used in your cutting application, it’s important to assess the cost savings that can be achieved by using insert over solid carbide tooling. With solid carbide bits, you must continually purchase new tools as they can only be sharpened 2 or 3 times. In addition, often the tool life, after sharpening, is reduced to 70-80% of original tool life, due to decreased rake angles. Finally, after sharpening you need to compensate for the diameter change that occurred as a result of sharpening. 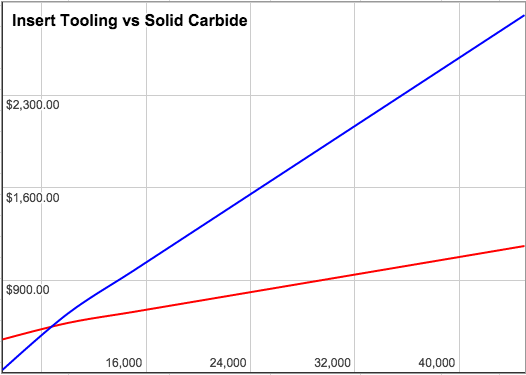 One of the biggest advantages of using carbide insert tooling is that you pay for the tool body one time and often get two cycles out of the same insert since the insert is often reversible. Keeping just a box of replacement inserts on hand saves tying up cash in spare tools on the shelf. The benefits of insert tooling, unfortunately, are not available for smaller diameter tools (such as 3/8 or 1/2″) as they cannot be constructed in 2 flute or shear design due to space limitations on the tool body. If you are interested in ways that you can reduce your total cost of tooling you can contact us now for more information. We also have a full service sharpening and insert grinding center with quick turn around times. When purchasing tooling for CNC routers the most common choice, especially for nested operations, is solid carbide router bits. Because of the overwhelming options, particularly in small diameters, number of flutes and improved feed speeds, solid carbide is a safe and popular choice. When it comes to machining thicker materials and when a larger diameter is acceptable, we offer the 6243 Series Insert Router Bit which is a two flute compression tool with replaceable insert tips designed to create a chip free surface finish on solid wood and laminated panel products. This up/down shear (compression) insert router bit is ideal for the rigors of machining thicker materials while providing the benefits that come with having replaceable carbide inserts. Initially only available with single sided inserts, this series has been completely redesigned to utilize double sided inserts providing a longer run time and cleaner cuts. With the recent design change, the cost effectiveness of this tool has increased dramatically. The up/down shear design, provides an excellent alternative to a 3/4″ solid carbide compression bit for machining double sided laminated panels, solid woods and plastics requiring a high quality, chip-free finish. The 6243 series is available in three cut capacities, 33mm, 53mm & up to 75mm! If you are using larger diameter (3/4”) solid carbide tooling, then consider our 6243 series insert bit. Reduce your tooling inventory and tooling cost substantially while improving efficiencies with a tool that offers a constant cutting diameter, economical inserts, rigid tool body construction and excellent finish results! Post written by Scott Smith, GUHDO USA Inc.